First, I forgot to comment last time on the NaNoWriMo wrap up stats. It was a boost to my confidence to find out that the average word count per writer was only 12,000, and only 14% of participants got to 50,000. Suddenly my 40,000 seems pretty good. So take heart, fellow NaNa-not-quite-winners, we still did well! It's interesting looking at their map - it's mainly only English speaking countries, with basically no-one from Asia, Africa or South America. It would be cool to see NaNoWriMo grow into other languages in the future, don't you think? So Act 3 needs a little work! 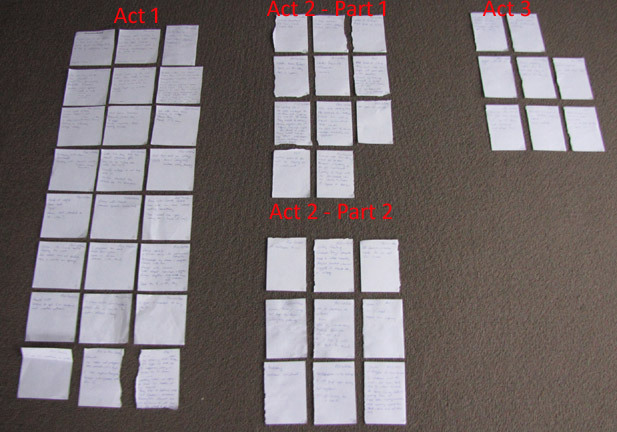 And Act 1 is only supposed to be 1/4 of the total, so that speaks my need to build in more plot complications in the middle. It will be interesting (for me anyway!) to see how this looks when I'm done. And for my followers in the northern hemisphere, here's a fun little video which illustrates what it's like to enjoy Christmas in this part of the world. Surf and sand by day... Christmas lights by night! The only downside is that you have to be seen in your swimming attire after eating all the yummy seasonal food! I will probably take a break from posting over this period, so Merry Christmas everyone! Remember the things that matter. Merry Christmas to you and yours, Charlotte! And I love your organisational method. Fantastic! Sign up to receive free updates on my books. Your email address will remain private. Critiques: Vital Information or Ego Crushers?